^ 英文俗名Mollusks；/ˈmɒləsks/是美式拼法，原因見 Rosenberg's. （原始内容存档于2009-02-17）. ；而拼作mollusc的原因參看 Brusca & Brusca. Invertebrates 2nd. ^ Chapman, A.D. (2009). Numbers of Living Species in Australia and the World, 2nd edition. Australian Biological Resources Study, Canberra. Retrieved 12 January 2010. ISBN 978-0-642-56860-1 (printed); ISBN 978-0-642-56861-8 (online). ^ 3.0 3.1 軟體動物門 互联网档案馆的存檔，存档日期2016-06-30. ^ 9.0 9.1 9.2 9.3 9.4 9.5 9.6 Ruppert, E.E., Fox, R.S., and Barnes, R.D. Invertebrate Zoology 7. Brooks / Cole. 2004: 284–291. ISBN 0-03-025982-7. ^ 10.0 10.1 Hayward, PJ. Handbook of the Marine Fauna of North-West Europe. Oxford University Press. 1996: 484–628. ISBN 0-19-854055-8. ^ Yochelson, E. L. Discussion of early Cambrian "molluscs" (PDF). Journal of the Geological Society. 1975, 131 (6): 661–662. doi:10.1144/gsjgs.131.6.0661. ^ Tompa, A. S. A comparative study of the ultrastructure and mineralogy of calcified land snail eggs (Pulmonata: Stylommatophora). Journal of Morphology. December 1976, 150 (4): 861–887. doi:10.1002/jmor.1051500406. hdl:2027.42/50263. ^ Ponder, W.F. and Lindberg, D.R. (编). 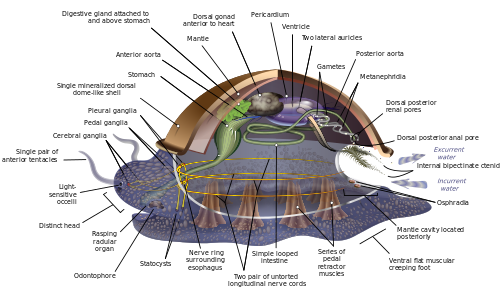 Phylogeny and Evolution of the Mollusca. Berkeley: University of California Press. 2008: 481. ISBN 978-0-520-25092-5. 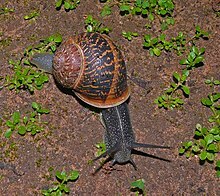 Mollusca. Integrated Taxonomic Information System （英语）. Starr & Taggart. Biology: The Unity and Diversity of Life. Pacific Grove, California: Thomson Learning. 2002. ISBN 0-534-02742-3. Nunn, J.D., Smith, S.M., Picton, B.E. and McGrath, D. Checklist, atlas of distribution and bibliography for the marine mollusca of Ireland. Marine Biodiversity in Ireland and Adjacent Waters 8. Ulster Museum. 2002. Dame, R.; Olenin, S. (编). The comparative roles of suspension-feeders in ecosystems. Dordrecht: Springer. 2005. Heller, J. Marine Molluscs of the Land of Israel. Israel Heb. : Alon Sefer. 2011: 323. ISBN 978-965-90976-9-2.